Mundo Deportivo claims Barcelona have set their sights on bringing in another player after Paulinho agreed to rejoin Guangzhou Evergrande. They want to strengthen the centre of the pitch and Paris Saint-Germain’s Adrien Rabiot has emerged as a transfer target. The France international’s current deal at Parc des Princes runs down in 2019. The report claims the midfielder’s contract situation ‘invites Barcelona to try the player’s signing’. It’s claimed a delegation from Barcelona with general manager Pep Segura and technical secretary Eric Abidal already travelled to Paris on Tuesday to meet officials from PSG. Barcelona need to know first hand if the French capital club are willing to allow Rabiot to leave this summer. Ernesto Valverde’s side do not want to upset PSG as they did in their pursuit of Marco Verratti last summer and ended up losing Neymar. 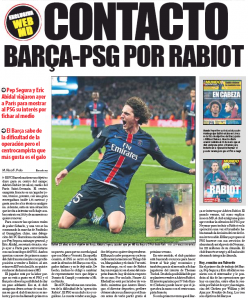 That is why the Catalan club contacted PSG about Rabiot’s availability. The 23-year-old is unhappy with his current employers and is aware of Barcelona’s desire. He sees a move to the Camp Nou as a step forward in his career. PSG president Nasser Al-Khelaifi is unwilling to let Rabiot leave this summer, while director of sports Antero Henrique prefers to sanction his sale rather than allowing him leave for nothing next year. Due to this situation, the French champions have turned their attention towards Chelsea’s N’Golo Kante.